Shipping via USPS 2-3 days service is standard and just $3.75. Moringa tea is not really a tea in the strict sense of the word. It is rather an herbal tea or tisane since it doesn’t contain tea leaves. This means Moringa tea is caffeine free! flavor contains the same crushed Moringa leaves as the natural flavor plus pomegranate juice extract. We absolutely love it and highly recommend it! 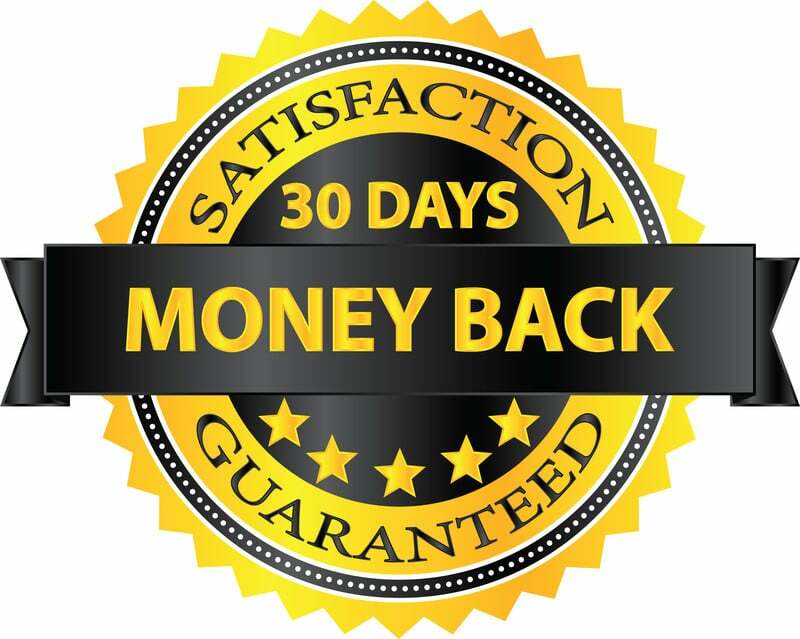 Order yours today with a 30-day money back guarantee! A rare source of one of the most powerful antioxidants ever discovered: EGCG (epigallocatechin-3-gallate) which is also found in Green tea. EGCG has been shown in many laboratory studies to inhibit an enzyme required for cancer cell growth and also to kill cancer cells with no ill effect on healthy cells. 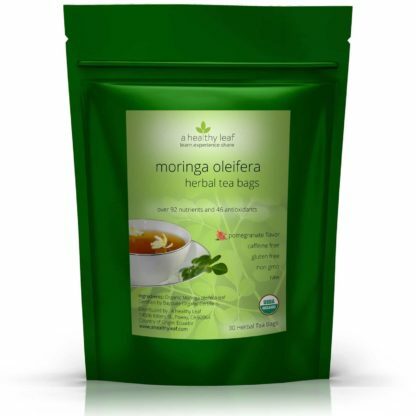 Dr. Oz Shares How He Loves Moringa Tea! 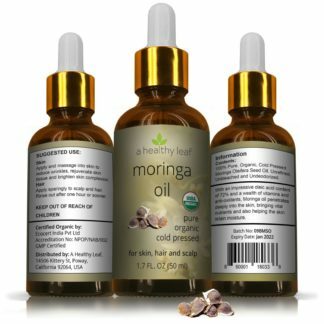 What I personally love – drink Moringa as tea! It comes in tea bags, you steep them, easy to do twice a day… Pop in a tea bag when you are feeling a little bit down and the beautiful part about this is you don’t get the downer from caffeine. To cold brew simply pour 6-8 oz of cold water over the tea bag and let it steep for at least 2 hours in the fridge. Leaving the tea in the fridge overnight to brew is preferable. When you remove the tea form the fridge be sure to stir and then squeeze the tea back when removing. To hot brew pour 6-8 oz of hot (~170 deg. F) water over the tea bag. Before water starts to boil, steam starts coming off the water. This is the perfect time to pour hot water over tea bag and let it steep for 3-5 minutes. Again, be sure to squeeze the tea bag when removing to extract as many nutrients as possible. 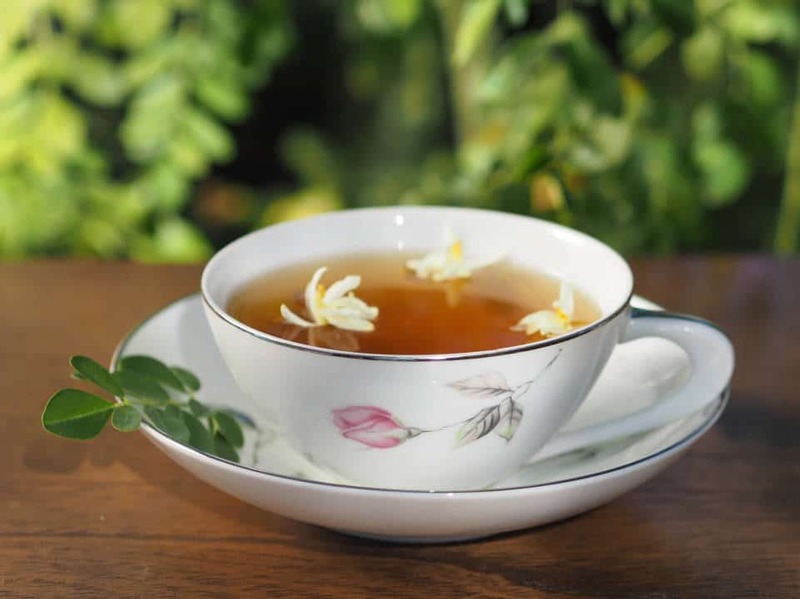 Flavoring: Unless you are a Moringa tea purist, consider adding a little honey and or lemon or ginger root to the natural tea for best results. The pomegranate flavor is excellent without any extras. 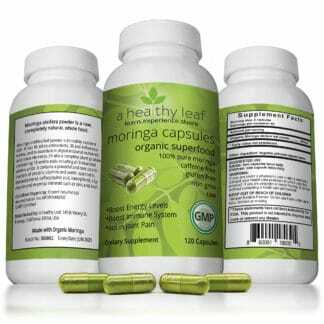 There is no recommended daily usage for Moringa tea. In fact, unlike green tea, it has no caffeine and therefore can be a powerful source of EGCG taken many times a day, at any time of the day, all without getting caffeine jitters! Consider taking a cup or two of Moringa tea to replace your morning coffee. 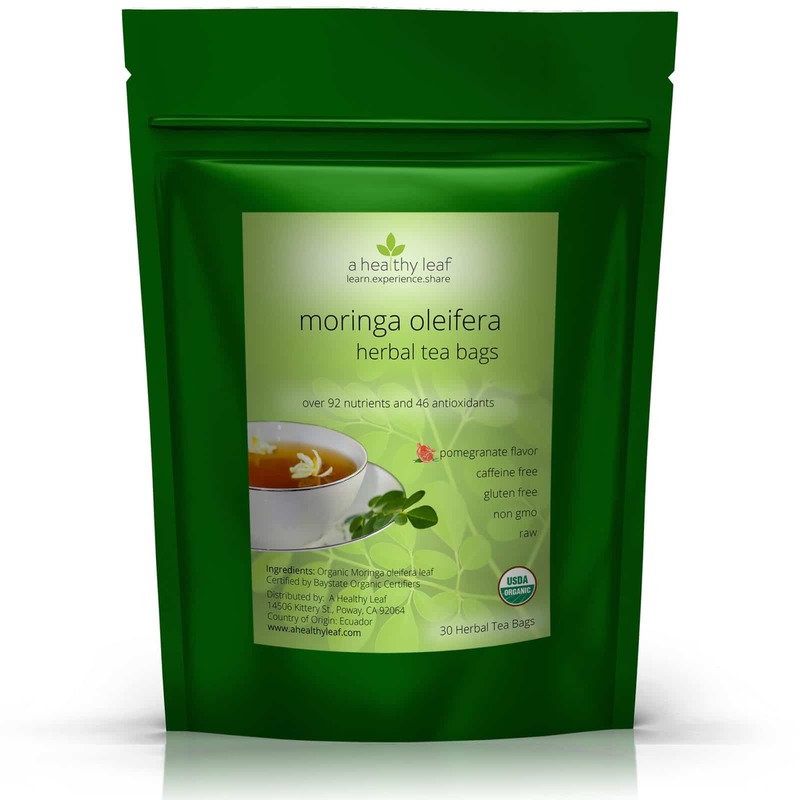 If you are trying to better control blood sugar drink a cup of Moringa tea before each meal. Drink throughout the day, as often as you like, knowing each cup is feeding your body powerful antioxidants and other nutrients! 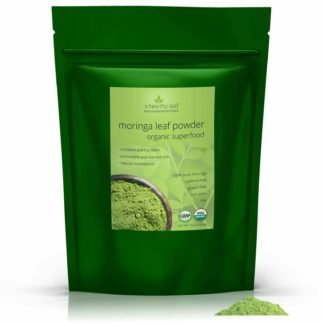 Our Moringa oleifera leaf powder used to make this Moringa tea is grown on a USDA certified organic farm in Ecuador, South America. After being harvested by hand, washed, and then rinsed, the Moringa leaves are placed into a dryer. The whole leaves are dried at a maximum temperature of 114 °F. Using this temperature controlled drying facility minimizes the time it takes for the leaves to dry while still keeping the powder a raw food product. This is important for both the purity and nutrient retention of the product. Open sun drying of the leaves, for example, causes the highest level of nutrient loss while shade drying is slow and puts the product at high risk of contamination. After being dried and pulverized, the Moringa leaf powder is shipped to the USA to be packaged in a USDA certified organic facility. The Moringa powder undergoes microbial and heavy metal testing. We are so pleased to report this powder is well below all allowable limits and is of very high purity and quality! It tastes delicious and is a good ‘pickup’ any time of the day. As a dedicated coffee drinker, in general, most teas usually taste like hot water to me. This moringa tea (the pomegranate flavored one) is an exception. It’s strong to the taste, and has been a really beneficial substitute for my usual afternoon cup of coffee. 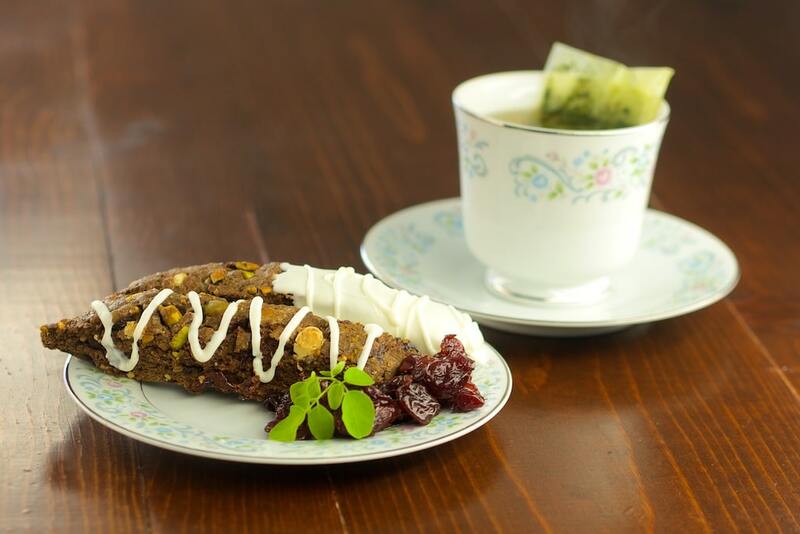 Great tea, great taste. I add ginger and stevia to taste. I am very pleased with this product. I received my order within days, literally. Next I plan on ordering the pomegranate flavored morninga tea. You will not be disappointed. I am always interested in the health benefits of organic teas. Was quite surprised and pleased with the flavour of this tea. The benefits, which i’m sure will follow, are a bonus( even though that was the reason i wanted to start drinking it in the first place). Love the taste and health benefits of this”tea”. Moringa tea has helped a lot. I get lots of energy and I’ve actually lost a few pounds. I’ve been eating healthy and gone for long walks to exercise but I was not losing the weight. I’m a 44 year old woman by the way. It has also helped me get up at night to the restroom less frequently. I’ve recommended it to two friends already and my sister. They all love it. Also, it was shipped really quickly. I love the service just as much as I love the tea!!! First off, the taste is not what I expected. Just a bit on the “bitey” side. With artificial sugar, “Pure” it’s tolerable. I have not had very many cups. Waiting for the goodness to happen!!! A Healthy Leaf shipped promptly and sent plenty of info on the product. LOVE IT! Good customer service! Hope to be buying more, in the future! Bought the tea bags and can taste the good quality will be buying more. This organic tea is good quality and good taste, since I’ve been using can notice a difference in my well being and a decrease in my joint pain will purchase again. very delicious with a dash of honey! 2 cups in the morning and your off to a great day. I love tea would order this again. MY NEW OBSESSION!!! OMG, this tea ROCKS!! Love the fresh flavor, just a HINT of pomegranate. I throw 1 tea bag in 16 oz mason jar before bed, and drink all day the next day. Cold brew for sure!! Of course, I live in AZ, so maybe for back east & northerners they’d like it hot. Either way is fab. MUCH prefer this to the plain! I cut open the bags after and toss in my smoothies as your video recommends. Just extra fiber & nutrients. YUMMY!!! What a delicious tasting cold drink (my preference). And I enjoy sharing this treasure with others. A gift I like to pass on. Thank you for the excellent service. My favorite new tea, I couldn’t be more pleased, I love it warm or cold with some stevia or raw honey and it taste so good, I’m a customer for life. I love the tea it taste great and I feel good when I drink it, I’m a customer for life. It’s a great sweet tea! This is my second time purchasing the pomegranate Moringa tea I so enjoyed my first bag that I never want to be without, I love a nice warm cup of tea and this happens to be one of my favorites, taste great and very relaxing and I feel great. Excellent product!!! I use it in my smoothies. Also have added to cookie recipes. Moringa tea is a great way to start your day. excellent way to start ones day. Just arrived! Came quickly. Great Price. Looking forward to trying very soon. Mmmmm! What a great flavor! Tasty, tasty, fruity, fruity goodness! Even without caffeine, makes me feel energized in a much cleaner way! Two thumbs up :)! I like this tea but the price is a little high given that I need to take 1 – 2 bags per day. I discovered that it helped me with my digestion after asking my niece if I could take a couple bags from hers and try. I heard about it in the past but did not know what it was good for. My niece told me to take the whole thing, she just purchased it form Ross but did not care to use it. I took it home and let sit for 3 ms. I was afraid to use it too given what I have heard about Chinese herb tea negative impact on the body. But, I decided to use it and was impressed how natural it was. I run out and tried to it in grocery stores but no one had it. I wonder why it is not in the stores!